From your friends at Supersonicsoul. One of the commenters to our story about the NHL vs NBA attendance debate brought up a point in regard to television ratings - namely, that NBA ratings are increasing over last season. Seemingly, this is a fly in the ointment for the argument that the NBA is struggling right now. Or is it? Anyone else notice something missing from that picture? That is to say, what about the other 23 teams? If the top 10 on your list includes Memphis and Philadelphia, and their improvement is just a marginal one, what about the bottom ten? How have their ratings gone this year? I'm not saying those other 23 teams are worse, and I'm not saying they're necessarily better, I'm just saying, well, I'm saying I have no idea, and neither does anyone else without access to the information. Pointing to that website and saying, "See, I told you the league is prosperous!" is somewhat like pointing to a list of the top teams with the 10 best won-loss records in the league and saying, "See, I told you all the teams are winning this year!" We only know 1/3 of the story. I can't imagine I'm the only one out there curious to see the rest of the story. Any ad-men out there with access to that sort of info, feel free to educate us. Couple of brief updates on our man Danny Fortson. 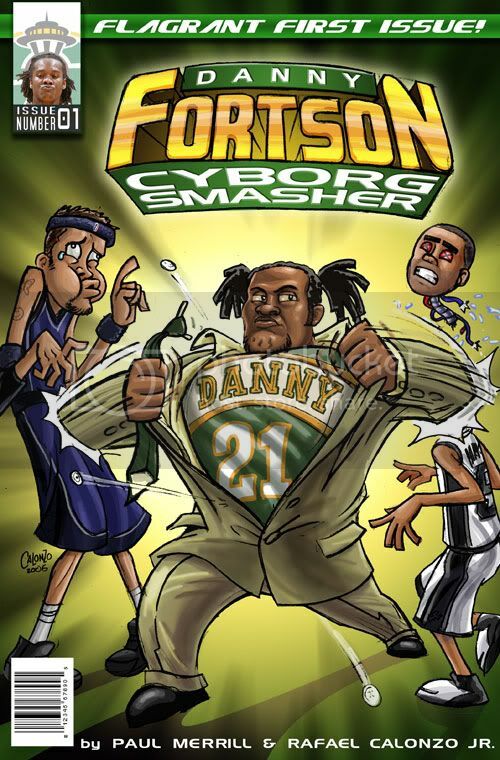 The first is a fantasy piece that puts a smile on your face for combining "Danny Fortson" and "blueberry pie" in the same sentence. The second, though, I can only hope is made-up, because it's just too disturbing otherwise. SuperSonicsoul: Still more manly than those man-loving hippy freaks in San Francisco, not quite as manly as those man-loving narcissists at Deadspin. Continuing my diatribe from last week, let’s look at another way to view attendance figures: Percent of capacity. That’s a pretty even distribution looking at it quickly, but if you delve deeper into the figures, the picture becomes bleaker. Also, as pointed out at Wages of Wins last year in a fine article about the NBA’s apparent popularity issues, the NBA has traded a city with poor attendance marks (Seattle) for one with strong attendance marks (Oklahoma City). However, despite WoW’s argument that Oklahoma City was 50% of the problem in last year’s attendance figures (i.e., the trade of OKC for N.O. and the lackluster figures in Seattle), the move of the Sonics to OKC has not alleviated the league’s problems at the gate. In fact, the numbers this year are even worse than last year. But back to the main point of this story – the capacity scenario. Another way to look at the numbers is to compare each team to its’ figures from last year. In other words, more than twice as many teams are facing declining numbers when viewed as a percentage of capacity this season, a staggering figure. Four of those teams are seeing their attendance drop by more than 10 points from last year’s totals, Philadelphia (from 73 to 62), Sacramento (from 82 to 70), the Clippers (from 86 to 72), and the Heat (from 99 to 81). How many teams have improved by more than 10 points over last season? Just one, Oklahoma City. (Although, to be fair, the Hornets are on the precipice, at +9.2 from last year). In other words, the only NBA franchise to see a substantial improvement from last season was the franchise the league decimated in its previous locale. Not exactly a stirring endorsement of the league’s fortunes. I'm guessing that when Clay Bennett drew up the outline for how things would go in his triumphant return to Oklahoma City this season, it was quite dissimilar to the way the actual story has gone. Following a Friday night loss to the Hornets which put the Thunder's record at 1-12, wundersenior PJ Carlesimo was sent packing in what was surely his final opportunity at coaching an NBA team. That adds up to 67-187, and marks PJ's cumulative record in his final five seasons as an NBA coach. It is a remarkably inept performance, matched only by the buffoonery of the people who hired him in the first place. Details are sketchy, but rumors are beginning to surface about Gary Payton making a return to professional basketball, but this time on the other side of the Pacific Ocean, at least as reported by solobasket.com. I'm not sure what was more surprising in reading that article, that Payton would like to subject himself to playing overseas, or that Bob Weiss is a head coach in China. I wonder if Bob Hill is planning to snake Weiss' job over there as well? In other news, Steve Scheffler has expressed interest in returning to professional basketball in the Turkmenistan professional league. That interest, unfortunately, has not been reciprocated. Indulge your narrator, please, as he attempts to explain why he has spent the past three days putting up negative information about the NBA, and allow me to correct some misunderstandings. I am not a hockey fan, despite the fact that I am an American living in Canada. In fact, were you to tell some of my friends up here that people now believe me to be an NHL fan, they would spit out their Tim Horton Timbits quicker than Ben Johnson at Seoul. I hate the NHL, I hate hockey, I hate people who say that hockey players are the greatest athletes alive, and I hate it when sportswriters couch their racism inside melodious descriptions of “gritty” and “tough” hockey players. The attendance information I presented is factual, not something I made up on my mom’s computer (actually, my mom doesn’t own a computer, or a basement, but thanks for asking). If you don’t believe me, go to espn.com and do the research yourself. I get it. The NBA is more popular than the NHL. I’m not an idiot, and any league which broadcasts it games on something called Versus is not even in the same ballpark. I never said that the NBA was in danger of being surpassed by the NHL in terms of American popularity – only a fool would say that. Why? Why bother bringing all of this up? Sorry to disappoint you, but it’s not sour grapes. 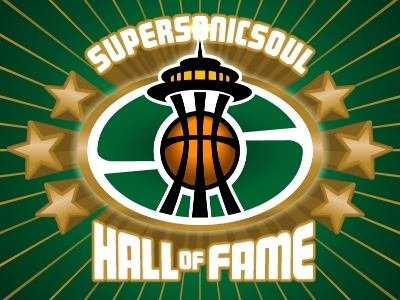 Well, it’s partially sour grapes, although I ask you: How do you expect me to feel about a commissioner who felt his loyalty to Clay Bennett superseded the loyalty Seattle fans had shown the NBA for 40 years? No, the true reason I brought this up goes back to what I wrote more than a year ago – that the NBA needs cities more than cities need the NBA. There’s been an emperor’s new clothes mentality for the past two decades about stadium building, and the continual escalation of arena modifications across North America resembles nothing so much to me as the Cold War. Arenas are not refurbished because city’s need them to be, they’re rebuilt because franchises need improvements to better compete with the other teams who just had their arenas rebuilt. It is my belief that the NBA – and perhaps sports in general – have reached a day of reckoning in this neverending one-upmanship. It is my belief that Seattle will enter into negotiations with the NBA with a completely different tact than in previous times, and that it – and other cities - will no longer have to be beggars for the NBA’s scraps. And, finally, consider this: Do you know anyone who plays hockey? Did your high school have a hockey team? Do you and your friends get together for pick-up hockey on Saturdays? I’m guessing the answer to those questions is no all around. And yet, despite basketball’s inherent advantages over hockey in terms of popularity in the U.S., here we stand, with hockey drawing more people this year. How is this possible? Rather than castigate me for presenting facts, how about a frank discussion about the troubles the NBA is facing, and what can be done to fix it? Would that not be more productive than insults? Nobody likes the guy who brings the bad news, but that doesn’t mean you should ignore what he has to say, either. For further illustration of the NBA's situation, take a look at the chart below, showing the per-game attendance of the Philadelphia Flyers (pink) and 76ers (blue). The Flyers started off the season with six consecutive losses. That's right SIX. The Sixers picked up one of the top prizes of the off-season (Elton Brand), and were expected to be a contender in the Eastern Conference. The Flyers have drawn more than 18,000 in all eight of their games this season. The Sixers have yet to crack 16,000. Can someone explain that to me? Is it just ticket prices? Is it something more? There are a hundred ways to talk about NBA attendance, a hundred ways to distort the truth, a hundred ways to rationalize, pervert, and obfuscate the facts. In the weeks and months to come, the NBA will attempt to use all of those methods. They will load us down with facts and figures that explain how wonderful the league is, how healthy its balance sheets are, and how strong its ratings are. That, my friends, is the cold, hard hand of reality smacking David Stern in the face. In the past six years, his league has gone from dominator to also-ran. [NOTE: To accommodate the NHL's work stoppage which eliminated an entire season, I shifted the NHL numbers from the previous season up into the empty gap. DAVID STERN: While we’re certainly concerned with flagging attendance levels, I’d like to remind you that the season is still very early. I know the press likes to make a big story out of this, but if you review our attendance figures from years past, you’ll notice that our attendance levels tend to increase as the year progresses and fan interest improves. REPORTER: While that may be true, the early levels have never been this low. Shouldn’t the creation of all these new buildings be a buffer against the current economic downturn? DS: Well, just look at the numbers in Portland, in Atlanta, in Toronto, or in Cleveland, where you have teams playing before near sell-outs every night. I think that’s a testament to what happens when our superior marketing and innovativeness are given an opportunity to grow and prosper. REPORTER: But what about Sacramento, where your team is barely beating Arena League numbers? Doesn’t that concern you? DS: Well, with a new mayor in Sacramento committed to keeping the team in that city, I think you’ll see an improvement in the team’s fortunes in the near future. REPORTER: You mean, when they get a new building? REPORTER: You mean, like the new building in Memphis, where they average 11,706 fans a night? REPORTER: Or in Philadelphia, where they attract only 62% of capacity with a playoff-caliber team in a sports-mad city? REPORTER: Or in Charlotte, where a brand-new stadium and a brand-new team with a Hall of Fame coach and world-famous general manager have lead to less than 70% capacity? Or in Indiana? New Jersey? Minnesota? Miami? DS: I think that if you look closely, you’ll see that nearly all of those situations involve teams which are struggling on the court, and that in almost all situations involving teams which are successful, the fans inevitably flock to the games. You can almost guarantee it. REPORTER: So what you’re saying is that the buildings you extort cities to build while their police departments, educational systems, and infrastructure erode have less impact on attendance than the on-court product? That on-court success is more important than $300 million arenas? That a winning Sonic team in Seattle in an “old” building would draw more than a losing Grizzlies’ team in Memphis with a “new” building? DS: Now you’re just putting words in my mouth. REPORTER: That’s not the only thing I’d like to put in there. Fans of the Saugatuck Dunes in Michigan are cautiously optimistic, now that the man who planned to level those dunes and build McMansions in their place (you know, this guy), is now in closed-door talks with Saugatuck city to sell a portion of his land. At first glance, one might come to the conclusion that either A) McClendon has grown a conscience, or B) needs the money. (Okay, fine, it's most likely B). On the second glance, though, one might walk away with another thought. Why? Well, perhaps its because he is doing the same thing in his own backyard that he did in Michigan. And that other folks in other parts of Oklahoma aren't so thrilled with our boy Aubrey, either. Chris McGann at the PI has an update on the KeyArena situation, specifically in regard to the likelihood of anything passing through Frank Chopp's iron fists this session in Olympia. The posturing from the State Capitol is pretty obvious when you read the article, leaving an observer to come away with the clear message that, while the legislature may be willing to let the city keep its portion of the hotel tax, it may also be keen to keep using those funds for general revenue. In a year where the national economy has gone from teetering on the brink of disaster to full-scale Defcon 5 emergency, Chopp and fellow members will have a pretty easy sell to the public if they cry poverty and give the thumbs-down to the city. Anybody else wonder if they served Starbucks at the press conference? Neither of those teams exist anymore. What do you get when you cross a team with the fifth-worst home attendance numbers with a team with the sixth-worst road attendance numbers? 10,165 in attendance, that’s what. Ah, it's too bad the Pacers don’t have a fancy-dancy new stadium. I’m sure that would solve all their attendance problems. I’m sorry, what’s that now? First it was the value of the shares in Chesapeake Energy dropping by more than 70%, then it was being forced to sell off his shares at rock-bottom prices, and now Aubrey McClendon has lost at the ballot box as well. Proposition 10 in California, which was heavily subsidized by our friend Aubrey to the tune of $3.5 million (which is, coincidentally, $3.5 million more than he volunteered to pay for the new arena in Renton), has gone down in defeat. This comes despite the fact that backers of the proposition, including McClendon as well as T Boone Pickens and others, spent more than $25 million in support of the bill. Opponents? They spent about $150,000. The proposition, which would would have created rebate incentives for the purchase of cars and trucks running on natural gas or other alternative fuels looked to be losing by more than 15 points at the polls. As Brian Robinson points out at SonicsCentral, a public memorial for The Tuba Man will be held this Wednesday, Nov. 12th at Qwest Field in Seattle. The event is scheduled for 6:30 pm. I'll assume that those reading this site are well aware of the tragic and disturbing circumstances surrounding Ed McMichael's death, but, if not, please read Robert Jamieson's fine piece at the PI for more in-depth information. It's a terribly sad story, and coming on the heels of everything else that's happened in Seattle over the past year, sadder still. Anyone who has attended a game in Seattle in the past decade has memories of the Tuba Man. The baritone voice announcing the song just played, the odd times he would mix in an unexpected song ... it was, obviously, an underappreciated part of being a Seattle sports fan, and now he, like the Sonics, is gone. If you're in the Seattle area, try to make time on Wednesday evening to attend the memorial. There is nothing we can do to bring the Tuba Man back to his family, but a large crowd would go a long way towards helping heal their pain. You remember the Oklahoma City faithful, right? They were the ones who spent the past year deriding Sonic fans for not supporting their team enough, insulting us for not showing the respect inherently due to the great and glorious NBA, mocking us for having our heads so deep in our granola bowls and espresso cups we couldn’t appreciate the wonderfulness of David Stern’s universe. Well, less than one week into their lifetimes as NBA hosts, they couldn’t bother to sell out a Sunday night game. I’ll say that again: Game 2 of the NBA Experience-Dust Bowl Version was not a sellout. Hey, I get it, it was the Wolves. And, who knows, maybe the AP made a mistake and entered the numbers incorrectly for the attendance. But, for crying out loud, if you’re going to mock us every step of the way for being “fair-weather” fans, if you’re going to spend every last ounce of your energy insulting Seattle for lacking the balls to be a great NBA city, don’t you think you ought to step up when you get your chance? Okay, granted, it's the NYC version of the X-Man, but I still think it would pretty darn nice pinned to my Members' Only jacket. Just curious, was this a Knick-only item, or are there brass-backed pins of, say, Armon Gilliam out there as well? Through three games last season, Kevin Durant attempted 19 3-pointers. After three games this season, he has attempted three (and missed all of them).